It’s been a while since I had set to my Kumihimo disc. 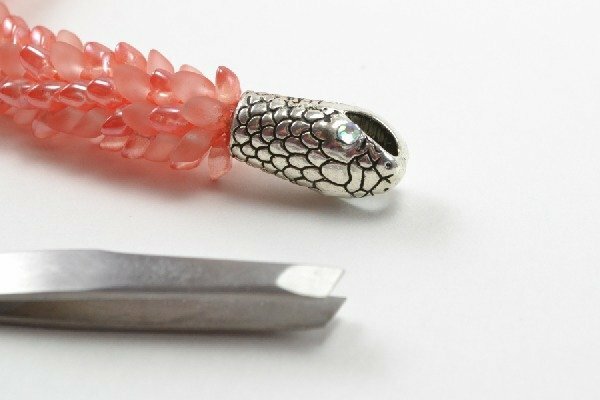 You see I’ve been in a crochet kind of a mood lately, but when I saw these snake closures (just search Ebay for “snake toggle clasp” – these suckers come direct from China and take about a month to receive) I knew I wanted some serpentine jewelry and this snake Kumihimo was born! Stringing on your beads is the most time consuming part of this process. 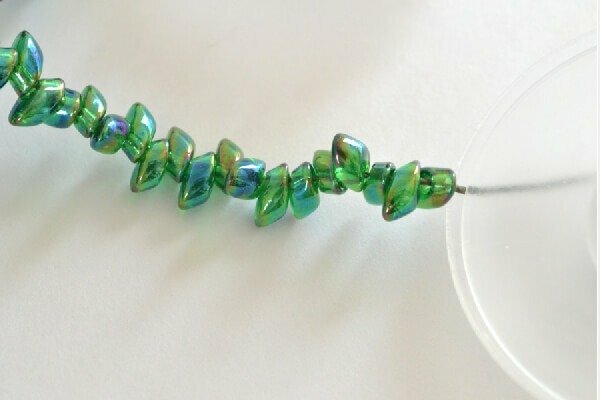 You want ALL of the beads to be facing the exact same way so that they lay down smoothly like “scales”. I did each of my bracelets with the beads in different ways on the cord but they both turned out the same for me, so that doesn’t matter… just that they are all strung on exactly the same. You will work a regular 8 strand Kumihimo braid. Nothing fancy, business as usual. Apply glue to the braided C-lon ends and allow to fully dry (until hard). Bend the knot over to make the thickness of your cord bigger. 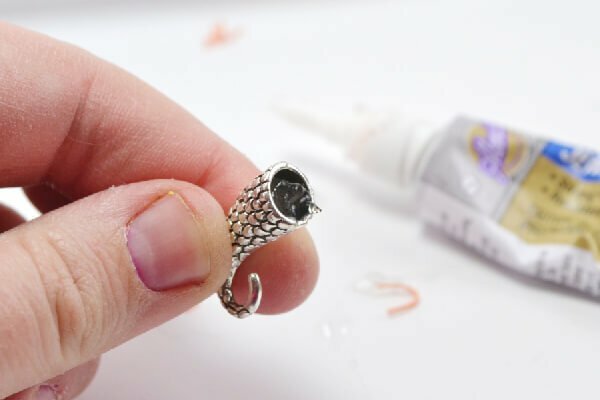 You may need a set of pliers to help if your glue dried super hard. Fill the end cap with glue about 75% of the way and shove onto the cord. 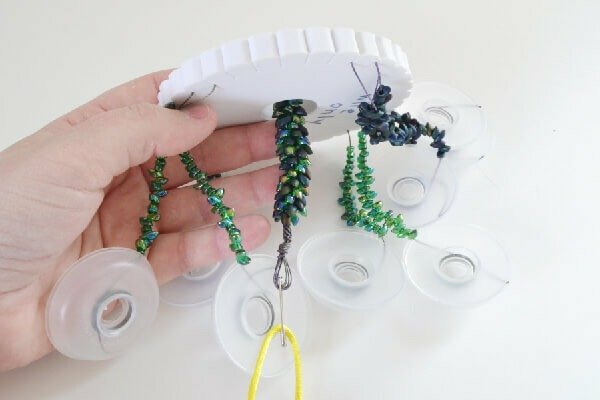 Hold tightly so that the glue sets to the cord as well as the first round of beads on the cord. I wanted my snakes to have fancy eyes so I busted out my glass crystals. This is totally optional. Using a wood skewer apply glue into the eye socket of the snake. Using tweezers apply the crystal, moving as needed so that it sits right. Allow to dry and then do the same for the other eye. Gah! Isn’t that closure super awesome? And I must say the crystals really set this one off! And the braid takes on a scaled appearance that completes my “snake Kumihimo” look! 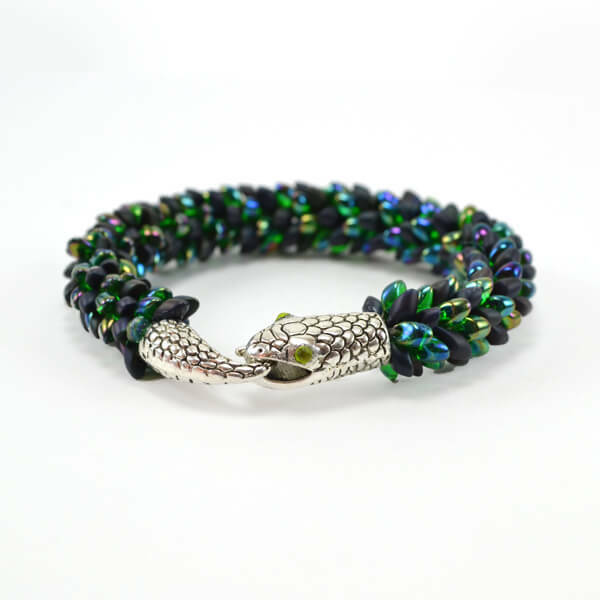 For this bracelet I used Miyuki Long Magatama Seed Beads in Transparent Green Luster and Matte Purple Iris. For my second I wanted something more subdued so my crystals weren’t bright or flashy and I used light colored beads. And it was nice using only one color so I only needed one hue of the C-Lon. 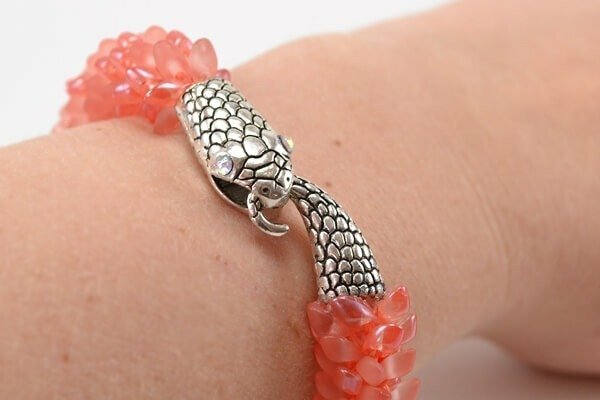 And for this bracelet I used Miyuki Long Magatama beads in frosted transparent peach and transparent peach luster. I can’t believe the timing of your blog/project. 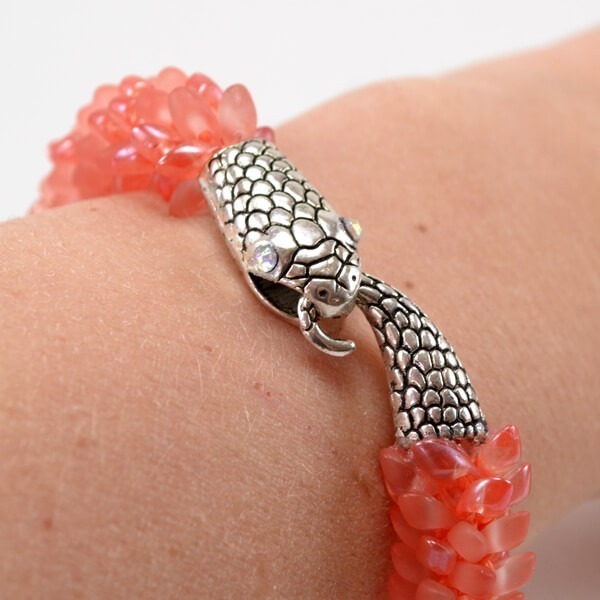 I am going to the Gem Show on Saturday and I am so going to look for the snake clasp and these beads when there. I love, Love, LOVE this!!! Thanks for sharing! Thumbs up! I LOVE this! Pinning! I want to make it with my little sis’! It’s as awesome for a 15yo as it is for a 30yo. (Besides, we have similar taste because good taste is genetic. Haha!) I can’t believe it takes a month to get the clasps, but it’s worth it and I can’t steal her until schools out anyhow. I will make a post of pics when we do it and link to this post for others to see your tutorial awesomeness! Thanks Allison! Hi – I love this tutorial and tried to make this bracelet about 8 times and 3 different ways but can not seem to make my magatamas lay so closely together – somehow, the cord stitches always show through. I have them laying the same way like yours, but you can always see the stitching and cord in between them, whereas yours seems to be hidden. I have done the kumihimo stitch before, making necklaces, etc, and for whatever reason, just can’t seem to master this bracelet. What am I doing wrong?? Any suggestions would greatly appreciated – thanks so much! Hey, there, Heather. You actually can see my cords but because I used matching C-LON (purple and olive for one and peach colored for the other) the cords aren’t as obvious as if I used, say white or beige cording. What color combo are you trying to work up? And as for them not being close enough together, you might try weighting down your Kumi while working it so that the strings work up tighter. That should do you! How many Miyuki beads did this take. I see different quantities available from different sites. You use 2 colors. Do you use 8 oz of each color (so total of 16 oz) or 8 oz for each of the 8 kumihimo strands. I purchased 16 grams of each color or 32 grams total and had a couple left over! Glad I looked at other comments. I needed to know the amount of beads needed. 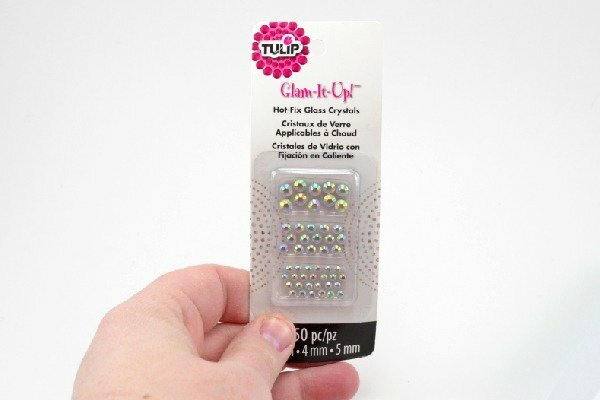 Wanted to let you know I ordered the claps two and a half weeks ago and they arrived today. They are just as great as they looked on line. GREAT JOB IN THE INSTRUCTION, I GOT IT THE FIRST TIME….GO FIGURE…THANK YOU. BY THE WAY….THE COLOR ( PEACH ) IS AWESOME. 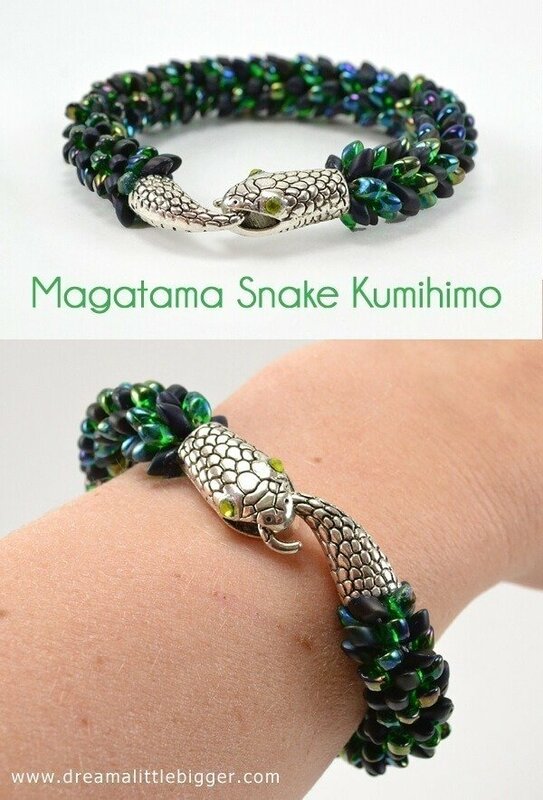 ANYTHING IN THE KUMIHIMO BRACELET MAKING WOULD BE GREAT AND I WOULD GREATLY APPRECIATE IT. I love your tutes, they’re so easy to follow (and pretty to look at). I was going to ask where you got the clasp from, but I got that from the other comments, so I just wanted to compliment you & say thanks. You’re inspirational and I LOVE your ideas! 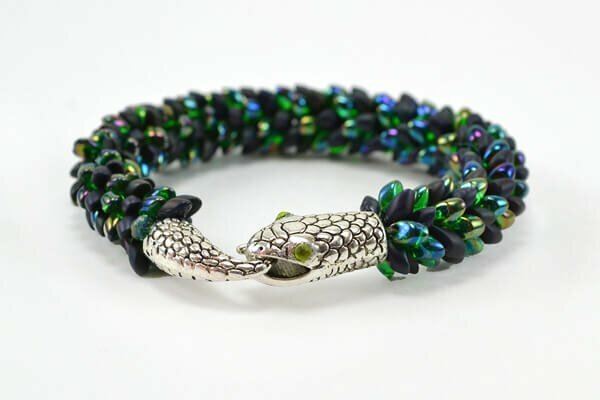 Where can the Snake Toggle Clasp be bought? Search Ebay for snake toggle clasps! I’m just wondering why your photos show 6 strands but your instructions say you’re using 8 strands on this bracelet could you please clarify that for us? It was an error. You use 6 strands. These are so cute. I had trouble with the first one because even though I put them all on the same angle when I put it on the bobbin they were not all in the same direction and had to start all over. I found a video tutorial using megatama beads with 8 warp. Happy beading! 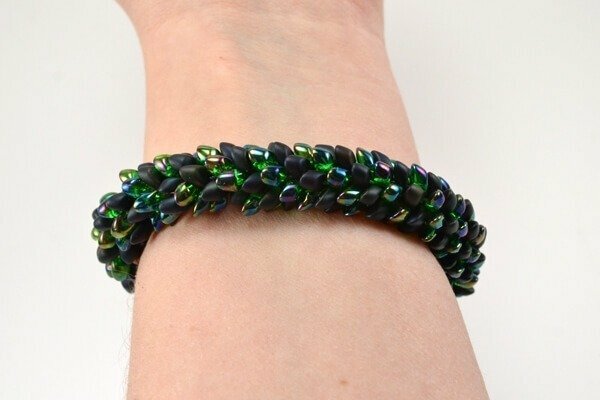 I have been wanting to make this bracelet for months and I have been searching for the green and Purple Iris megatamas for months. Can’t find them and I do love those colors! Any idea where I can find them? Absolutely! There are links in the post, but they’re here, too just for good measure! How many beads/packages are required for one bracelet? I’ve seen package sizes of 8.5, 50, 100, 250 grams, etc….. I used two 8 gram bags of each color (for a total of 4 bags). Best of luck! 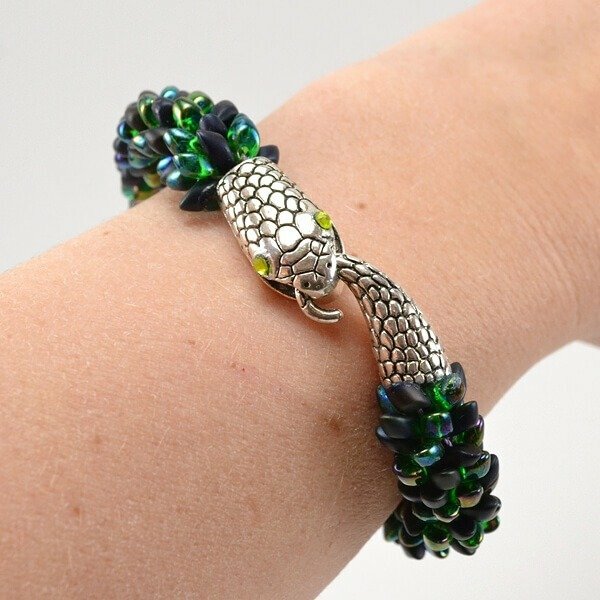 I love this snake bracelets!! 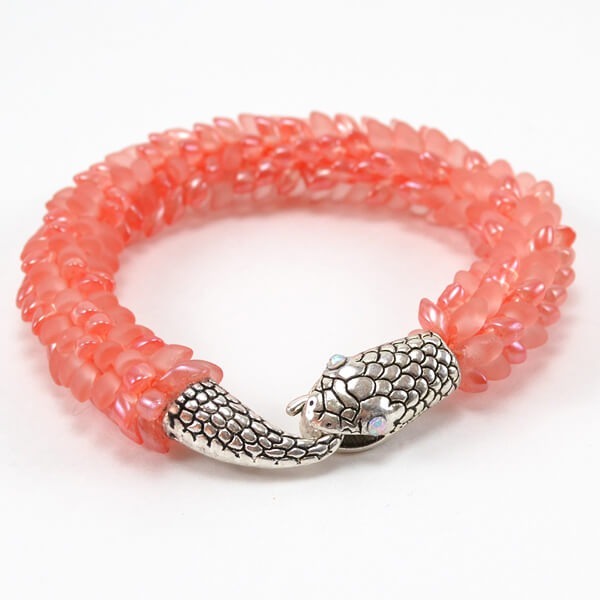 I want to order some of the snake clasps but I noticed that there are a couple of different sizes. ( 23 x 13 ) & ( 29 x 18 ). Not sure which ones to order so that the finished bracelet will fit properly. Thx for the tutorial. ? I would go 29×18. Good luck! Snake clasps can be purchased at Shipwreck Beads in Olympia, WA. I have made several of these bracelets. Always a big hit with customers.